Like Khubilai Khan’s great invasion fleets of the thirteenth century, the Spanish Armada sent by King Phillip II against England in 1588 is legendary not only for its size and power, but also for its defeat and near-annihilation by courageous English sea dogs and the notorious storms along the rock-fanged British coast that lashed the Armada as it fled. 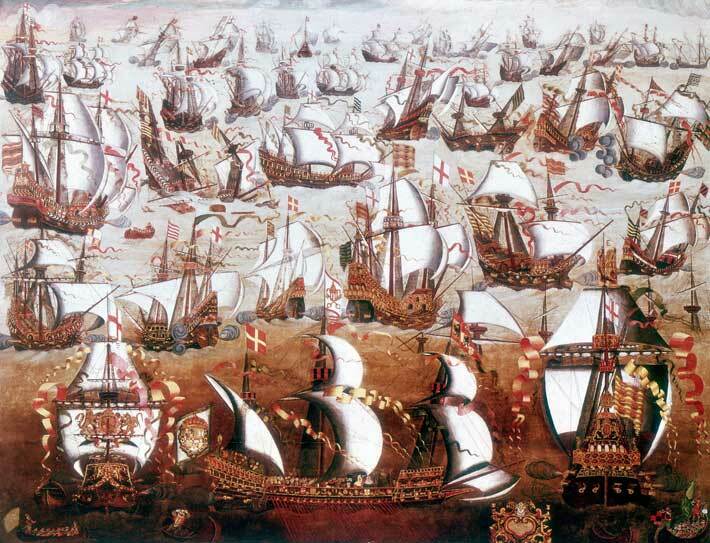 Drawn from a variety of ports and sources, the 130-ship, 30,000-man Armada was to invade England, oust Queen Elizabeth I from her throne, and restore a Catholic monarchy, while also ending the Dutch revolt against Spanish authority. The ships included galleons and galleasses, and merchant ships requisitioned from the Baltic and Mediterranean. With some 2,500 guns, the fleet was seemingly unstoppable. Brave and decisive action by English captains is credited with halting it. The English employed tactics such as launching fire ships, vessels set ablaze and sent to crash into and scatter the anchored Armada. The English also had superior rates and accuracy of gunfire. The Armada, driven north, attempted to flee to Spain by circumnavigating the British Isles. As a commemorative medal struck by a victorious Queen Elizabeth noted, “God breathed,” and winter storms lashed the Armada, sending a third of the ships and two-thirds of their mariners and soldiers to watery graves on the shores of Scotland and Ireland. Initially rediscovered by divers eager to find some of the wealth of drowned Spanish noblemen, the Armada wrecks became the subject of decades of archaeological work by Scotland’s Colin C.M. Martin and others. Wrecks such as El Gran Grifon, San Juan de Sicilia, Girona, Santa Maria de la Rosa, and La Trinidad Valencera have yielded evidence of life on board, as well as of the particulars of the ships themselves. Martin’s work has brilliantly shown that poor preparations and haste likely helped doom the Armada, much like the Khan’s invasion fleet. Navigational instruments with mathematical errors along with poorly prepared and badly cast cannons show a lack of care in preparation. The math errors suggest to Martin that Spain’s rigid religious views, which led to the expulsion or forcible “conversion” of Muslim and Jewish citizens after 1492, likely drove off Spain’s most educated, math- and science-literate population. Meanwhile, the two-wheeled, overly long Spanish gun carriages had to be manhandled out of the gun ports, while crews frantically tried to match cannonballs, which, though cast for specific guns, had been tossed indiscriminately into piles. The English had smaller, more easily maneuvered, four-wheeled gun carriages, and uniform-sized guns with shot that fit all their weapons. Archaeology provided the explanation as to why English rapid-fire gunnery was answered slowly, sometimes at a snail’s pace, by Spanish ships with more cannons but no means to use them effectively.